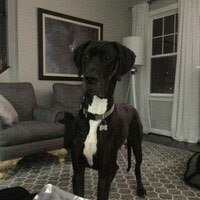 I am a licensed vet tech in both MD and VA and have had Great Danes for 21+ years (both my own and fosters) and have never required a fence before my current boy. Rescued at 10 weeks he has grown into an adolescent that has a mind of his own. I truly wonder if his mom stepped on his head as a puppy. After seeing my neighbors dog respond to the hidden fence I decided I’d give it a try on my 1 acre lot. I seriously thought my Dane would blow right through it – he’s special that way! Much to my surprise quite the opposite happened. He learned within the first 10 minutes what the flags meant. We did have to spend the first 2 days coercing him out to show that it was ok. He very quickly learned he had the freedom to run and play fetch all while staying at least 10 feet away from the flags. We are in week 3 and he has become a different dog. Since he can now really get out and do as he wants, he is much more relaxed in the evenings. Even 4 mile runs with me didn’t do that. He can now enjoy time with us when we are out for yard work, cookouts, etc. – something we couldn’t do before as he would run. He is finally turning into the Dane I always knew he could be! After getting a new dog we wanted to make sure that she could enjoy running around outside. We did quite a lot of research on the different options available and chose the Pet Stop system as it trains through rewards, not punishment, i.e. an electric shock. Mike was very prompt in returning our communications and turned up when he said he would, did a thoroughly professional installation and then we started on the training. The training is very much reward based, teaching the dog about the boundaries and our dog took to it very quickly, enjoying the training, yet staying within the fence line. 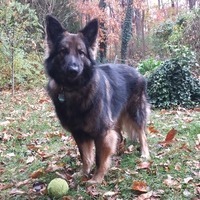 It has been a week now since we had the system installed and we are extremely happy with our choice, we have the right product and in the last few days our dog hasn’t even gone close to the fence line, she enjoys running around in the garden and we enjoy the peace of mind that the fence provides. There is nothing more beautiful than the sight of a tired puppy! Hidden Fence has maximized the quality time we are able to spend outside with Holly. The obedience shift was remarkable. Let’s be honest, most dogs aspire to be in the wilderness 24/7. 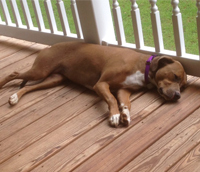 We moved to this area because of the wide open spaces…and so did Holly. Thank you Mike for giving us the freedom to relax and enjoy the sound of the door opening. Shannon A.
I just wanted to write to you to tell you how thrilled I am with my Hidden Fence containment system. I waited a few months to see how well the system per­formed and it has been better than I ever expected. 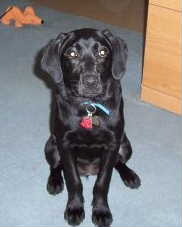 As a veterinarian I have seen the sad loss of too many of my patients when they wandered off their owners prop­erty. None of my 4 dogs has left my yard since you did the installation!!! 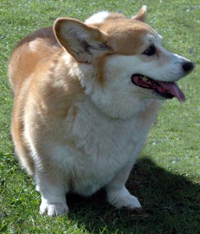 My one corgi was a daily traveler. She introduced me to many of my neighbors as she was saved from the road or walked in their open doors uninvited. She has stayed home ever since she started wearing her collar and even when I forget to put it on. My other three still run and play all over the yard but never leave home. I feel so much better that I know my beloved companions will not be injured or killed in the busy roads around my home. And I am sure my neighbors are happy that they don’t have my sweet Pinky coming to Christmas dinner this year as she did last year. I have recommended your system to many of my clients and I will continue to do so in the future. You were professional and served all my needs and even returned at no charge to fix a problem that I made with the original containment plan. Thanks again foi giving me peace of mind. Paula Horne D.V.M. 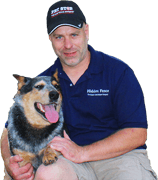 Hoof & Paw Veterinary Service, Inc.
“One of the best investments I ever made was to get a pet fence. I don’t regret a cent of what it cost. And the kind of service I received from Mike Schultz was far beyond the norm of today. 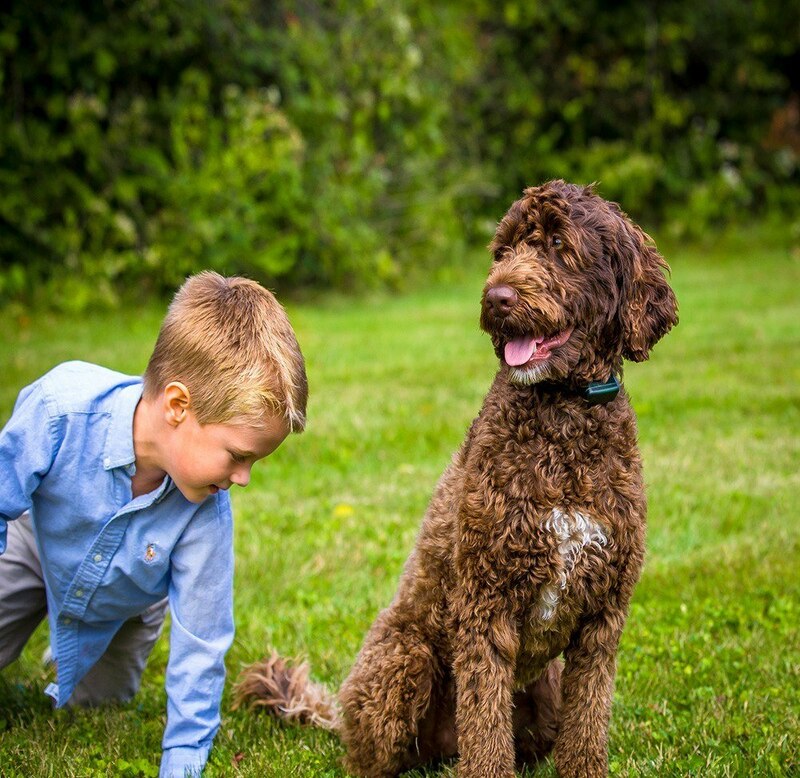 “When we decided to move from Ashburn, we began looking at homes with property primarily so our dogs could have more room to run. We looked into all types of fencing solutions and eventually found Michael at Hidden Fence. A client at the Animal Hospital in which I work recommended him to me. My fence is wonderful! My dogs now have the freedom to run and enjoy the yard as we had always hoped. We had my fence installed one weekend and by the next weekend my dogs were without leashes. The training was that simple! I have to say I was a little skeptical in the beginning with the hidden fence because I have 3 large shepherds, but Michael took the time that was needed to help train them. I love my hidden fence and my dogs love the freedom that it allows them to have. I would and have recommended this fence system and Michael to anyone interested in having a safe yard for your pets to run. “We have had a great experience with Hidden Fence. 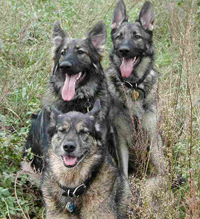 It is effective with our four, very different, wonderful, adopted rescue dogs. We tried two pet containment systems in our search for a more humane system. We value the wide range of warnings and correction levels that help avoid overly harsh corrections (and tested the correction levels on ourselves). We appreciate the positive, high motivation training which helps offset any fears. 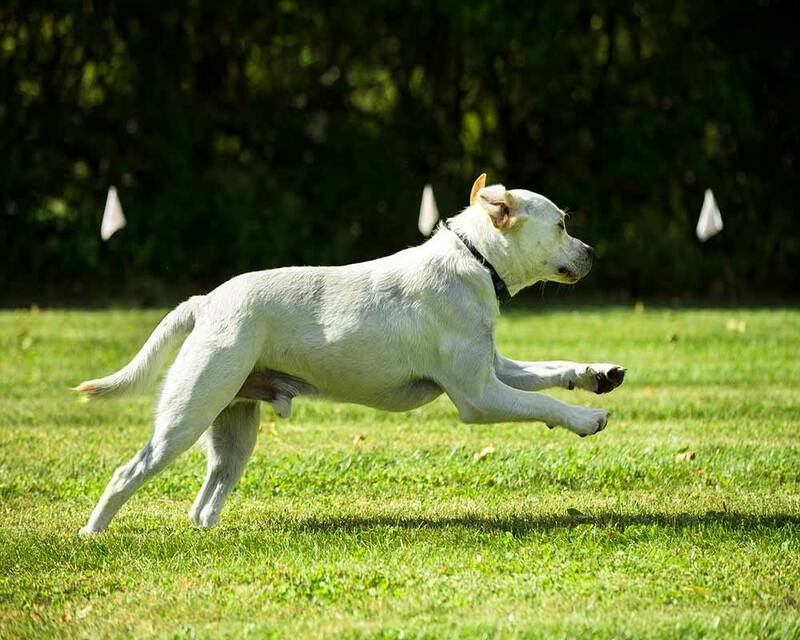 Our newest dog actually seemed excited about the high reward training (and we didn’t dread it!). 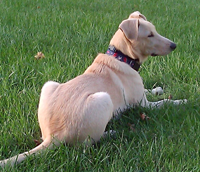 Our dogs are respectful, but not fearful, of the fence and yard. They back off the fence when they hear a warning and/or feel a correction, but they don’t cry out. 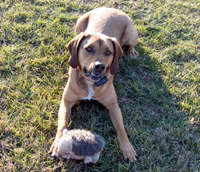 We can set each dog’s correction individually at just the right level necessary to keep each one in our yard. Also, the customer service is impeccable.” Mr. & Mrs. R.
“We wanted to thank you for all your help in helping us make the decision to go with Hidden Fence. We had looked on line, got a quote from your competitor, and we just weren’t convinced. We then decided, because of the cost difference, to go buy one at the pet store. We brought it home, looked at the video, and decided we did not want to fool with it. We then called your company, and were sold on you and your product. I was impressed with the fact that you showed us the equipment, and the wire you used. Everything was a much better quality than what we saw in the package we bought at the pet store. It may have cost more, but believe me, it was worth it! Thank goodness we found you. 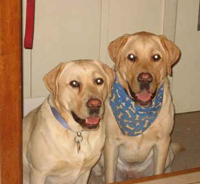 “As the owner of high energy black Labrador Retrievers that were both adopted from the local animal shelter, we were faced with the problem of how to confidently contain our two rambunctious dogs while allowing them the freedom to run around our fenced yard. Four board oak fences did not work. They dug under wire fences. 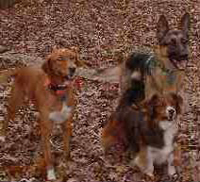 Several dogs in our rural neighborhood had recently been killed by speeding construction trucks. We explored the competitors and the do-it-yourself electric fences. In search of a solution, we contacted Hidden Fence through their website. Almost immediately, we were contacted by Michael Shultz, who described the system from installation through training. 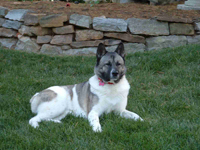 “Hidden Fencing has successfully kept my dog “Ming” safe and in her yard…even though she is a VERY strong willed Akita! Mike spent only one afternoon with her and with his positive reinforcement she caught on right away. The fence was installed in 2003 and to this date she has never “broken out” inspite of the fact that, as an Akita, she is very “prey driven” and would like to eat the neightbors small dog! 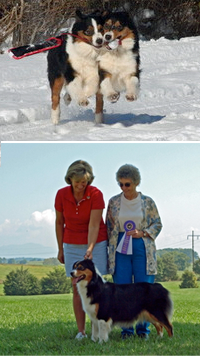 “The training methods are very humane and work well with a sensitive dog. The collars can be set on different strengths so that my wild Doberman can have one setting and my sensitive Dachshund can have another setting. 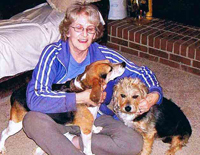 I recommend this system of dog containment very highly.” Dr. Chris Bailey, D.V.M. “Originally, we spent over $1000 on an inferior system that required repeated service. The installer, who advertised quality materials and full service, eventually refused to even answer/return our phone calls. “WOW!! Sierra’s fence has been in action since yesterday at 4 PM and it is now 11:40 the following morning. I must say, I do honestly believe that ALL OF US are really enjoying it. She is doing very well with it. We have not upped her level. She is still where you left us last evening. Every time we have gone out, we are running the yard, most, if not the entire perimeter of the fence. I’ve been walking the perimeter, outside and shaking the flags. I think she’sto the point where the flags are very noticeable to her now. Once last evening she went through, when we were out playing…. I brought her back in and then I went through and waved the flags. That has been the only incident.. Currently when we go out I have been running with her inside her area, then I shoot outside the perimeter and she has been staying far enough away, seeing the flags and knowing that she’s not supposed to be that close. We’ve played ball and when the ball went out, she stopped and looked a me as if to say… “You’re gonna have to go get it cuz I’m certainly not gonna do it!”– She’s gotten close a couple of times and she backs off. When the trash collectors came this morning we were outside and she went over and watched them. I think this fencing is one of the best investments we have made, both for us and for Sierra. 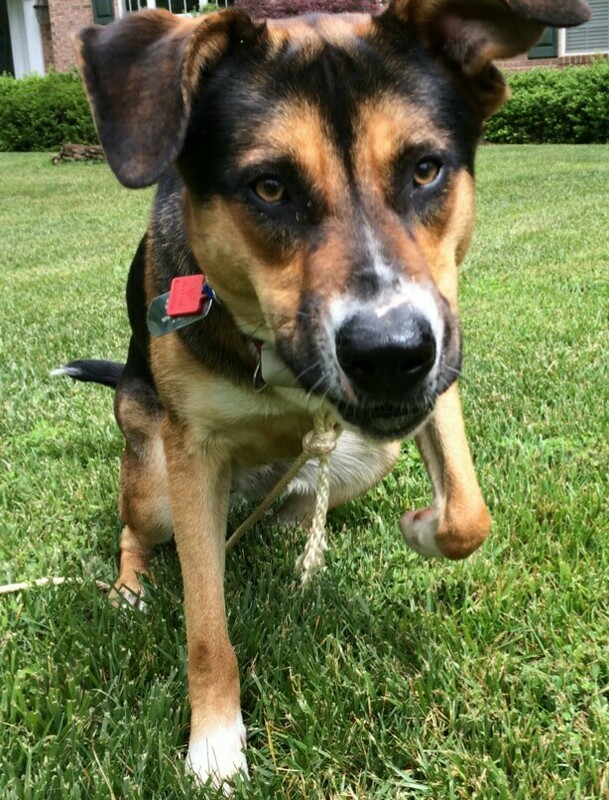 She enjoys the freedom of the yard and not being confined to a tie chain and we enjoy being able to play with her. AND ALL OF US ARE GETTING SOME MUCH NEEDED EXERCISE! I have noticed that Sierra seems to be a bit calmer than before as well and I am guessing that this is because she has the opportunity to run and play and use up some of that ENERGY that she has. We got our fence installed in November 2015 in Sterling VA. We are on a 0.23 acre lot, so not too big. We have a long hair GSD named Dr. Zaius. He was 8 months old when Mike installed our fence and we love it! Our neighbor across the cul de sac had Mike install theirs years earlier. Dr. Zaius took to it slowly and was hesitant, but now knows his limits well. When we go for walks we take the e-collar off and he still hesitates until we use our password: PICKLES and he know he can cross. It has worked so well that when we travel Dr. Zaius stays around what ever house and yard we are at, my in-laws or brother-in-law’s houses Dr. Zaius know he has to stay around the house. Even when playing with my brother-in-laws’s dog at their house he knows to stay close to the house. It’s worked so we’ll we are recommending Mike to our friends who just got a puppy themselves. We have been a customer of Hidden Fence for roughly 7 years or so, and have really never had any problems with its operation during this time. Our main contact with the company since its installation, has been to reorder batteries for the dog collars for our Pom and our Chocolate Lab, every 6-8 months or so… Have generally spoken with Mike, who is just a great guy, very pleasant, and easy to deal with… Unfortunately, I had to place a Service Call to him in order to request someone to come repair the buried electrical “fence line,” which was damaged (cut) by a sub-contractor, burying their own cable line on my property. Was able to set-up a “repair appointment” within 4-5 days, but, because of a cancellation, Mike called to see if I was available for their service call in 3 days… Mike arrived at the agreed time, and after explaining how the damage occurred, Mike advised that he would check every location where my cable line and Hidden Fence crossed, to make sure that we wouldn’t have further problems with the electric circuit to the Hidden Fence. Mike found/repaired 4 “bad splices” from the cable contractor, PLUS ANOTHER SPLICE from when my Irrigation System company, replaced my sprinkler heads, and accidentally cut/repaired the Hidden Fence line. I then asked Mike to re-mark (spray paint) the location of my Hidden Fence, so I’ll know where to mark before I get my fall lawn aeration done… Mike finished the job in about an hour or so… I would certainly recommend this company, to anyone who might be considering purchasing a ” Hidden Fence” lawn/property containment system…Great folks to deal with…..
Hidden Fence is the best! We have had an outside system installed over three acres and it has given our dog the freedom she needs to explore and be independent. Any problems or issues are handled immediately and satisfactorily, We have purchased two inside units, for the kitchen and bedroom because our dog, Dakota can find a treat inside a suitcase, even if it is hidden. She had figured out how to go around the perimeters of the kitchen unit and would sneak in against the wall to get whatever was available. Nick tested the system and fixed it so the dog cannot get around the area we need protected so we didn’t have to buy an additional unit. We have been very happy with the service and professionalism of Hidden Fence. Now Dakota loves these two men, but she might be catching on to their ulterior motive! Use the form below to submit your own testimonial! 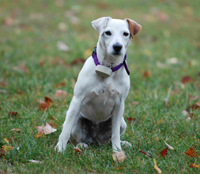 Hidden Fence and Perimeter Technologies are not associated with Invisible Fence®, Dog Guard®, Dog Watch® or PetSafe®. These trademarks are the property of their respective owners.